To change the student login credential and to get access to the student portal, the student has to initially,enter the URL of the application (http://Organisationname.classe365.com/) and should sign-in as a student to the student portal. After Entering the URL of the Organisation,the Landing page will be displayed and then student should sign-in with the existing username and password that is given by the administrator to sign-in into the student portal. 2. After sign-in as a student, the student will be able to view his profile. When the student clicks on My Profile ,the student name along with the profile details will be visible to the student. 3. The student can change their Login Credential by,clicking on the symbol next to the Attachments and then selecting Edit Login Credentials. 4. 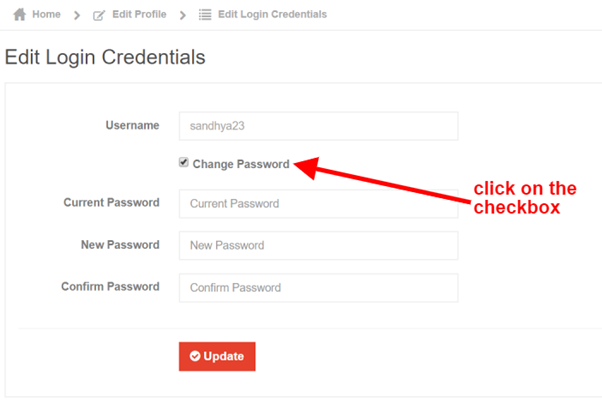 Student can change the existing username and then by clicking on the checkbox, password can be changed. 5. The student should enter the current password that was provided by the administrator and in the new password, the student can enter the password which he/she likes and confirms the same password.clicking on update the student credential gets set-up.